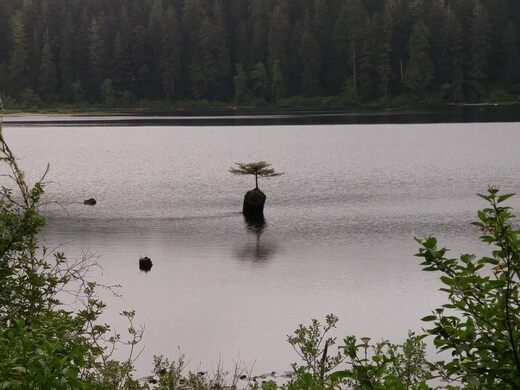 Seventy miles from the port city of Victoria, British Columbia on Vancouver Island, a plucky arboreal wonder can be found on the quiet waters of Fairy Lake. 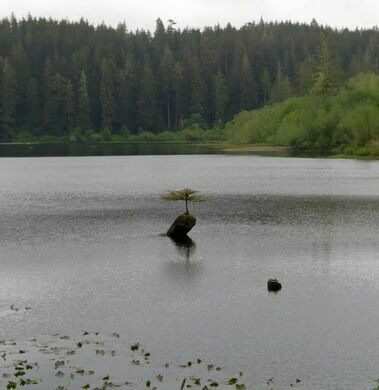 Living up to its name, Fairy Lake is in a remote and unspoiled landscape near the town of Port Renfrew. Sticking up out of the lake’s stillness is a submerged log. Clinging to that log for dear life is a tiny Douglas fir tree. The log itself is a Douglas fir. As the stunted tree’s only source of support and nutrients, it feels like the dead tree made a sort of noble sacrifice to the the tiny tree growing on it. Tourists, boaters and hikers come seeking it as a unique window into nature and rebirth. The “bonsai” tree has attracted more than a few photographers to capture its struggle of endurance, including a winner of the National History Museum of London’s Wildlife Photographer of the Year award. Award or no award, each photograph of the little guy clinging to his dead log has demonstrated its own symbolic twist on survival. You needn’t even hike through the wilds to find it. You can find bonsai serenity from the road. 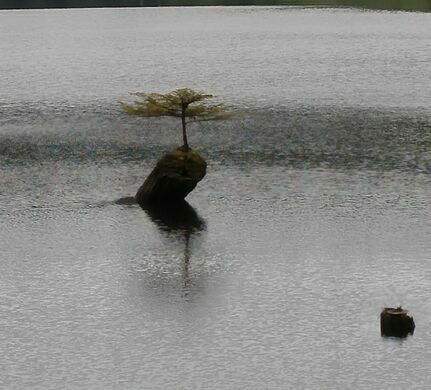 Fairly Lake is on Vancouver Island, about 5 miles east of the town of Port Renfrew. Take Parkinson Road to the turn-off for Deering Road, follow to the end and turn right onto Pacific Marine Road. Follow that all the way to the lake. The little tree will be on your right, about a quarter mile past the turn-off for Fairy Lake Recreation Site. It may be tough to spot, so keep your eyes peeled for it.